August 17 is National Vanilla Custard Day. The term “custard” refers to a variety of culinary preparations made with milk or cream, egg yolks, and sugar. Depending on its consistency, custard can be served on its own or used as a filling for other desserts or dessert sauce. Custard is usually cooked in a bain-marie to prevent overheating. When overcooked, custard curdles therefore its preparation is quite a delicate operation. The consistency of custard depends on how much egg or other thickener (for example, starch) is used. There are different types of custard depending on its consistency. For example, crème anglaise (English cream) is a thin pouring source and crème pâtissière is a thick pastry cream. Crème anglaise with added gelatin is called crème anglaise collée. Custard without eggs thickened with starch alone is known as blancmange. Custard mixed with whipped cream is referred to as crème légère. Custard is often flavored with vanilla. 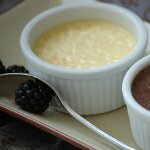 Vanilla-flavored custard can be consumed on its own or be used as a base for other desserts. For example, crème brûlée consists of a vanilla custard base topped with a layer of hard caramel. To celebrate National Vanilla Custard Day, indulge yourself with your favorite custard-based dessert.